A rollicking, hilarious stagecoach journey across the Great Plains and over the Rocky Mountains was just the beginning of a nearly six-year-long odyssey that took Samuel Clemens from St. Joseph, Missouri, to Hawaii, with lengthy stopovers in Virginia City, Nevada and San Francisco. By the time it was over, he would find himself reborn as Mark Twain, America's best-loved and most influential writer. With a pitch-perfect blend of appreciative humour and critical authority, acclaimed literary biographer Roy Morris, sheds new light on this crucial but still largely unexamined period in Mark Twain's life. Morris carefully sorts fact from fiction to tell the story of a young genius finding his voice in the ramshackle mining camps, boomtowns, and newspaper offices of the wild and woolly West, while the Civil War rages half a continent away. Lighting Out for the Territory is a fascinating, even inspiring, account of how an unemployed riverboat pilot, would-be Confederate guerrilla, failed prospector, neophyte newspaper reporter and part-time San Francisco aesthete reinvented himself as America's most famous and beloved writer. 5. 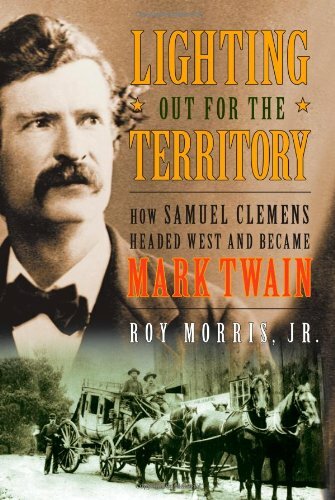 Lighting Out for the Territory: How Samuel Clemens Headed West and Became Mark Twain [Hardcover] Roy Morris Jr.